Just a few hours ago, the natural frequency of our Earth, or the Schumann Resonance, hit it's highest recorded value, ever. This is the natural heartbeat of our planet that all biological life entrains to. Normally this frequency has hovered around 7-8Hz since it was discovered in 1953. Over the past couple years, it has been increasing. In 2014, it would start spiking to 14-16Hz on certain days. Last year, we would see it hit 30-40Hz. Today it shot up to 90Hz. "Yuuuge spike!" Scientific analysis shows that our brainwaves will entrain to these frequencies. By definition, entrainment is "to draw along with or after oneself." So essentially, the Earth is shifting higher, and drawing our minds along with it. Ironic that this spike was on the symbolic date of Easter. We are co-creatively resurrecting the Christ Consciousness upon our planet. That's a pretty important thing, just wanted to let you know. What is the sound of silence? AND What is the color of darkness? To answer the first question there exists what some call the deafening sound of silence. If you go into a room that is perfectly silent it is possible to hear the sound of silence. It is not tinnitus and it is not your mind playing tricks on you. The sound of silence sounds like either high or low pitched tones. It sounds like tuning forks or singing bowls if you ever used singing bowls. These sounds really exist if you focus on them. The sound of silence is a perception of the energy that surrounds us. Sometimes the tones are in harmony and other times not. Through listening to the sound of silence on a daily bases it is possible to become aware of the love waves and know of their existence. The love waves are part of the sound of silence when it is harmonized. To answer the second part of the question darkness does indeed have color. Like perceiving sounds coming from pure silence it is also possible to see light and colors from pure darkness. In a relaxed state is possible to see the phosphines which are the gateway to the soul. If you go into a dark room with absolutely no light it is possible to see them. The light of the phosphines comes from the glowing of the pineal gland. The pineal gland is the only part of the human body which gives off its' own light. The pineal gland can glow in the dark like a firefly. When it glows your mind will see this internally as phosphines. If someone is smart they are literally bright because their minds are illuminated with phosphines. This is the true illumination. These light patterns in the phosphines are also affected by the love waves. The light patterns will ebb and flow with the coming of the love waves and it is possible to see this happens. The uninitiated are simply not aware of such things even though it occurs all around them. Below is an example of what Phosphines can look like. The afternoon light that comes in is very white. Even in winter. When my eyes are closed and I see this kind of pattern it's complex and varies in speed and morphing shapes. Do you all not see the coincidence here? P.B. Katehi the Chancellor of USC Berkeley has numerous patents on VHF antennae and frequencies applications and the Schumann resonance just happens to spike during these violent outbreaks at her college? Hmmmmm.. and now we have these crazies all over, the reports in Chicago of 18 killed in 20 hours, Detroit a killer gone nuts, Memphis reports of crazies on the freeway, and now the FB killer running lose in Cleveland, OH. So I ask you does anyone think maybe Katehi and her cohorts are doing a massive experiment messing with minds enhancing the Schumann resonance so it spikes to 90 hz dragging all the little brains along with it for the ride just to see what happens! Almost like tainting a water cooler with a virus just to see how long it takes to infect the entire building huh??? There may be some resonance or another that jumps up and down, but the Schumann resonance is literally based on the shape and size of the earth, which (hopefully) isn't jumping up and down. Could you share where the citation was posted about this huge spike? Schumann resonances are global electromagnetic resonances in the cavity formed between the earth’s surface and the ionosphere. Schumann resonances were named after German physicist Winfried Schumann, who first predicted them in 1952. Electromagnetic impulses like those from global lightning flashes (Earth’s thunderstorm activity) fill this cavity and excite the Schumann resonances. The first accurate measurements of the Schumann resonances were made from 1960 to 1963 and since then there has been an increasing interest in them across a wide variety of fields. Radiation from the sun ionizes part of the earth’s upper atmosphere and forms a conductive plasma layer, the ionosphere. The ionosphere surrounding our planet is negatively charged relative to the earth’s surface, which creates a strong electrical field between the earth and ionosphere. 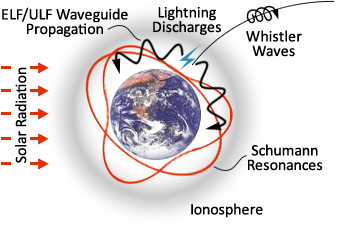 Schumann resonances occur because the space between the surface of the earth and the conductive ionosphere acts as a closed waveguide. This waveguide acts as a resonant cavity for electromagnetic waves. 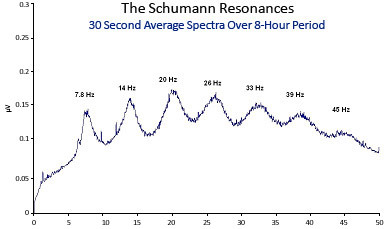 Schumann resonances appear as distinct peaks at extremely low frequencies starting around 7.8 hertz, which is considered the fundamental frequency. Schumann resonances in Earth-ionosphere cavity. Courtesy NASA. (also see the live data https://www.heartmath.org/research/g...cms-live-data/). Be interesting if the equipment to read these things will be in California. It may not be that the Schumann resonance changed but they have found a way to enhance it locally somehow using antennae arrays. It would make sense they would want to do it around the equipment used to read such things and I bet ya Berkeley has those things. Last edited by Jengelen, 17th April 2017 at 19:54. What's your source please for the Schumann Resonance(s) ? I've had a passing interest in the Schumann Resonance(s) but have never managed to find any publicly available "real-time" up-to-date data-sources ... and as far as I am concerned, the supposed link between the SR and the apparent "awakening of Humanity" has yet to be proven as more than some "new-age myth" eh ? The schumann resonance is a product of the size of our atmosphere and the size of our planet (or more specifically, the space in between the two; there is a 'cavity 'defined by the surface of the Earth and the inner edge of the ionosphere about 20 miles up). Unless our atmosphere is rapidly changing size, the "schumann resonance" will not change. But it does echo "octaves" of itself, at higher frequencies. is 90hz an octave of 7.8~8hz? (its pretty close!) It's better to think of it in musical terms really. The resonance is not a set number, (though the numbers are related!). Back in 2014, when i was following Dr Simon Atkins, he mentioned something about this and when it spikes up around 90 certain people wont be able to cope with it and they will go crazy. Interesting now, because the planet as a whole really does seem to be losing the plot. i think it is safe to say that..
"they" dont want our vibration to climb but to stay low?? what are chem trial clouds for, if not to block the sun keeping it from reaching us..
besides the obvious, it would defeat "thair" purpose. Last edited by Greenbarry, 18th April 2017 at 01:32.